Wallace Creek's station is the nearest to our house -- it's in the shade, and it's in a draw, and is often ten degrees cooler than the average for all the other stations in our metropolitan area. The airport station gets a little higher than ambient sometimes -- at least I hope it does, because the reading, if I read it right for that one, says 108F. I'm thinking, if I don't keel over on the way home, I'll be farming by moonlight. Update: 106 in Eugene today (Wed.), 102 here -- house was 68 at 5:30 pm, which after three days of triple digits, is pretty decent. Considering. It's 77 in here now; 87 outside, yet inside feels much hotter. I'd find this interesting but my brains have turned into a bubbling bowl of bleh. For years, we were bamboozled by the term "fall planting." It conjured up an image of late September afternoons, dew on orb-weaver spiders' webs, and pumpkins taking on that golden sheen. The problem with putting in seeds for winter harvests in the fall is, of course, that the days are already too short for proper growth. Eventually, perhaps in our reading, or just stumbling around in the garden, we caught on. Fall planting is done in high summer. Everything should put on height and weight before the short days. The trick is not to let the heat "bolt" things -- cause them to run to flower and try to set seed. We've hung a shade over the first of the two beds that are in the polytunnel, and we'll hope that helps some. Here risa is cutting through the newspaper/straw mulch in one of the beds with a right-angled trowel. She'll make an opening in the mulch about seven inches in diameter. ... and spreads a bit more potting soil over them, lightly, before moving on to the next spot. Later, she'll bring the watering can and soak each hill gently, with the rose of the can at ground level. Much later, as in a month or so, she'll thin the hills. This isn't a perfect procedure. Lettuce, for example, really likes a bit more sunlight than this for sprouting. But we find that splitting the difference works okay, and gives us fewer things to have to think about. One size almost fits all, so to speak. The resulting bed, as a rule, after thinning, has enough variety of plant life to confuse plant predators and to share space with different root systems going after different nutrients. A new term might be needed: "fall polytunnel polyculture planting," perhaps? 92 in the shade ... going inside. We're having a run of days in the 90s, (F) with triple digits coming up. The pump has been working overtime! When it gets too hot to be in the sun, I sit in the patio shade with whatever project I've saved for the purpose. Today it was shelling fava beans; tomorrow, too. It looks like there will be about two gallons. This afternoon I checked the temperature in the patio -- 91. In the potting shed -- 100. In the house -- 69. Quite a difference! the awnings and the white paint appear to be doing their job. 1. Plant something - with any luck, by the time you read this, there will be a fall/winter bed planted inside the hoophouse (which has no polyethylene on yet). (Do we like polyethylene? No. Can we afford enough glass to do this, or the time to go find enough via salvage? No.) I'll make hills amid the mulch, six to eight inches across, of outdoor planting mix, shake some seeds from an herb shaker onto the hills, cover lightly, press lightly, and move on to the next spot. What's in the shaker? Three or four kinds of lettuce, beets, 2 kinds of carrots, red chard, spinach, turnips, kale, collards, bok choi. This spring all of these came up but the carrots; most were kind of hit or miss, but the turnips came on strong! Many are now softball size, with greens up to three feet long. It will be interesting to compare the fall planting. 2. Harvest something - tomatoes, yellow zucchini, eggplant, bell peppers (small and green yet, we jumped the starting line), green zucchini, turnips, turnip greens, peas, chard, lettuce, potatoes, dandelions, strawberries, trout, pikeminnows (one of these weighed two pounds -- don't let that "minnow" fool ya). They make great compost starters. Chicken eggs, duck eggs. 3. Preserve something - froze peas, dried and bagged zucchini chips, chard, spinach, dandelion, plantain, and turnip greens. Shelled fava beans and peas for seed. 4. Reduce waste - Emptied the compost barrel onto the heaps to start a new batch in it with the pikeminnows. Put the fava stems and pods in the compost barrel. Also gave the sunchokes a haircut as they were shading the corn, and put that in as well. Turned all the heaps. They are all steaming! 5. Preparation and Storage - not so much. Unless we get to count the composting and collecting of -- ahem! -- liquid fertilizers. 6. Build Community Food Systems - selling duck eggs. Two film cans full of kale seeds are off to the community pantry's two-acre garden. Going with what we have, a combination of the ability to visualize a project and carry it out using materials found on the premises, is a nice skill, but it helps to stockpile some useful things. As we've mentioned before, we collect burlap bags from a coffee shop, at fifty cents each. They're good for storing potatoes, or taking on a variety of tasks. A number of things we've done lately, such as blinds and awnings and a tote bag, begin with these sacks. Often we cut them open along the seams with a scallop-edged bread knife, as above, and then sew the panels together with yarn, wire, or whatever, or staple them to boards or laths. In this case we're using 30-pound-test fishing line, found in an old tackle box left here by my dad. As it's been in the dark all this time, the line has much or all of its original strength -- it becomes brittle in a season of sunlight, which is one reason dedicated anglers replace the line on their reels every year. Whether single-strand or double strand, heavyweight fishing line works well with burlap -- a canvas needle is nice but not required, as the line is stiff enough to stitch into the fabric all by itself. Hundreds of feet of fishing line can be bought, by the spool, for a quarter or fifty cents at yard sales, and even at retail it can be worth it -- we always get the heavy stuff, and also invest in a few sailmaker's needles. In this case, the newly stitched, rolled-up burlap has been unrolled inside the new polytunnel, to be suspended as shade for fall/winter vegetables soon to be planted. The fabric could also be used to make an awning or a garden path. Now we suspend the shade, which should cover most of the bed during the hottest part of the day, in whatever way we can. In this instance, fishing line, baling wire, lath, and duct tape were all used. Seed is to be planted underneath, and watered, and when the plants reach the shade cloth, it will be removed, rolled up and saved for some other use, some other day. They make good garden paths. Compostable, too. Cost of this project, you ask? Umm, was about four dollars. The take-home lesson is: stockpile your burlap! ... or whatever like it works for you. If the "animal world" does it, it's a widespread and quite normal behavior of great interest to biologists. If the rich do it, it is cornering the market, and it is smart and good business. See under commodities trading, subheading: speculation. If the rest of us do it, it's dumb, antisocial and as soon as "they" get around to noticing, illegal. Joseph is said to have advised the Pharaoh to build grain bins. Lots and lots of grain bins. The difference between that advice and a lot of what goes on today was this: when time came that the Egyptian people began to starve, they came to the bin supervisors and were given what they needed. 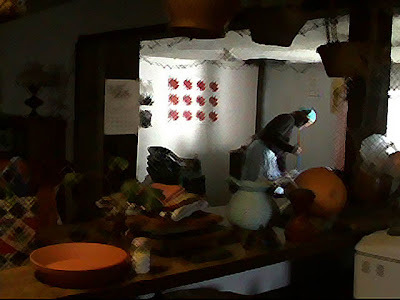 It was an effective use of tax revenues, in the form of a portion of the harvest. And nobody sneered about it on cable news and called it names. If I were everyone, I'd suggest to my local, state, and national governments to build us all some big grain bins. And I'd make a note to self to build a small grain bin. And come the time to open that bin, if the governments didn't follow my advice, and only the rich are there to offer us the remaining grain for a price we cannot afford, self will open that small bin and share with the neighbors. 1. Plant something - no, but made and set up the shade cloth for a fall/winter bed that will be in the polytunnel. 2. Harvest something - a few TOMATOES (!!) ... yellow zucchini, green zucchini, turnips, turnip greens, peas, chard, lettuce, potatoes, dandelions, elephant garlic, onions, strawberries, basil, chives, stevia. FINALLY there is more zucchini than I can eat in a day. 3. Preserve something - froze peas, dried and bagged basil, marjoram, chives, onion blossoms, zucchini, cilantro, curly-leaf parsley, lavender, blackberry leaves. 5. Preparation and Storage - collected kale seed, almost a cup of the stuff! Went through some dried foods that we kept too long and consigned them to compost. 6. Build Community Food Systems - selling duck eggs; giving away kale seed (of course). 7. Eat the Food - from frozen: pear sauce (we made lots last year), blueberries, pecans, filberts, chicken soup. From the land: Duck and chicken eggs (the Rhode Island Reds have come on line!) bok choi, turnips, turnip greens, potatoes, zucchini, elephant garlic, onions, kale, chard, dandelions, peas, lettuce, spinach, strawberries, mint, basil, chives, stevia. Made quite a lot of mashed turnips, yum! From storage: wheat, cheese, oats, rye, red beans. "8." We're eating quite a lot of blueberries, fresh, sauced, and frozen, bought from a farmer about five miles away. He's u-pick, but we didn't have time that day, so he said, "Well, I got a coupla grocery bags full, here, can't sell as fresh, but if you get to them quick they're all good. If you don't want 'em, or anybody by the end of the day, they're all to the chickens." We got a super deal and the ones that looked like they might moosh soonest went straight into the sauce pan. On the left, July 19, 2008. For years we regarded the circle garden as sufficient for our needs. In 2008 we began the expansion, adding the first fifty foot beds. On the right, July 19, 2009. The circle garden, with its inefficient overhead sprinkler, has been absorbed into the scheme of fifty foot beds with soaker hoses, and the polytunnel is under construction. It's not necessary to be a great carpenter to run a homestead; learn a few basics and then improvise. Here we're drilling a scrap cedar 2X4 in order to attach it to two t-posts that serve as the polytunnel door frame; it will be the door sill and the attachment will be simple bits of baling wire pushed through the holes at the ends and "twistied" onto the posts. We get older tools at yard sales or as hand-you-downs; they tend to last longer than those of recent manufacture. This drill, for example, is from the late 1940s and while it shows signs of slowing down, it may last another decade, by which time, if I'm alive, I'll be seventy. The door is a leftover piece of 3/8" plywood cut to 32" wide and a suitable height, drilled along one side in three places to take door hinges also of baling wire, which will be sufficient for the purpose. A door handle of some kind is wanted, both on the inside and outside of the polytunnel, so a scrounge in an odds-and-ends bucket having turned up two cabinet door knobs and a screw that fits them, here we are grinding off the head of the screw to make it double-ended and attach both knobs to the same place on either side of the door. The grinder is over fifty years old as well, and shows no sign of slowing down. Here, we are setting up to pound in two t-posts to make a door frame and also stiffen the polytunnel structure a bit against the anticipated winter winds. A little effort has been expended on proper placement of the hoops and posts, but not too much. In this heat, sweat keeps pouring into my eyes, and the numbers on the measuring tape are a salty blur, so I tend to improvise techniques that offer a little forgiveness around the edges. The idea, after all, is to grow food, not praise. We think it will do. It's too hot to do more in the out-of-doors till evening, so I think I will start on the burlap shades for the fall planting in the polytunnel beds. 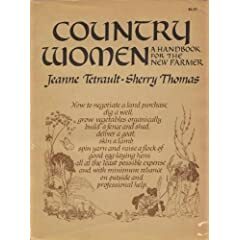 For more on these kinds of skills, see Country Women : A Handbook for the New Farmer, Tetrault and Thomas, 1976. We bought ours new, way back when. Oldie but goodie. We hear talk of Permaculture all the time now, though we don't know personally anyone around here who claims to be doing exactly that; when I first read about it I got all excited, and then I as read further, I kept running into "wowie-zowie" stuff -- artwork like that from the Sixties that came out of the psychedelic crowd, and varying sets of "principles" that reminded me of the lists of rules from communes I visited -- but did not settle down in -- in the Seventies. I felt like an outsider then, and am feeling a bit like one today. Pictures of Permaculture study sessions that I've seen have a similar effect on me; everyone sitting in a circle looking suspiciously like a pantheistic religious ceremony in progress. I'm too deaf for circle-sitting, not to mention impatient and cantankerous, so while I'm not as critical of these really quite nice goings-on as the double quotes around things in the preceding paragraph might lead you to think, I'm not going to latch on to the term to describe what we do at Stony Run, at least just yet. A word we have used, which is popular with permaculturists, and which I wish had wider dissemination, is polyculture. It's a useful term, for me, because it seems to combine elements of companion cropping with succession cropping, and even of crop rotation. There are also aspects of overstory-understory cropping, which is certainly one of the things one reads about in the Permaculture literature. We have twenty-one garden beds here, and twelve of these are fifty feet long by three feet wide. There are fruit trees in several of these, not columnar apples (which would have been a fine idea) but serious semi-dwarf apples, plums, and nectarines, some of whom are ambitious to be standards (full-size). Their roots are of course just ... everywhere ... and sapping nutrition and moisture from the garden, just like the books say, but we're not too worried. There is enough to go around, especially as we use quite a lot of manure tea and compost tea on all our mulch, even on the pathways. And the shade from these trees is useful for helping some crops, such as lettuce, reach maturity in hot weather without bolting. In the same beds we also have t-posts planted at the ends, with wire strung between them, for racking beanpoles or tying up tomato plants with string suspended from above. By planting peas and beans practically everywhere, we add nitrogen and shade the soil, conserving moisture and encouraging earthworms. This is companion planting, but it also meets some of the requirements that have led to the practice of rotation planting with "green-manure" crops. In the understory beneath the beans and peas there are beets, turnips, radishes, spinach, onions, leeks, garlic, red cabbage, green cabbage, broccoli, collards, tomatoes, bok choi, kale, lettuces, chard, and even a few carrots scattered everywhere and growing in profusion. Many of these were planted from an herb shaker into which a variety of different seeds had been poured and shaken together. Small hills, scarce six inches across, made from mixed potting soil and compost and tucked into the wintered-over mulch, alternately received plantings of beans and coles in this manner, across half the garden. I've done this for years, though I can't find anything quite like it in books. Say I'm naive, but to me all these plants seem to have enough to eat and drink, and are stunningly free of insect pests and diseases, despite being grown in such a tangle of root and branch. Some young things have suffered, but it is usually because they were not all thinned when they came up together in the same spot. Since there is no particular place you can go to pick a crop of all one kind of thing all maturing at once, most harvesting here amounts to a kind of treasure hunt. (Beloved says it is a scavenger hunt ...) I'm never quite sure what will hit the basket and in what order; or, if I'm really only after spinach to blanch and freeze, I have to cruise around looking for the right plant or plants for my purpose. But since the spinach plant, even in a hot July, is two feet tall and wide, has deep green twelve inch leaves, and hasn't bolted, the basket fills quickly enough. I'm not sure how you would apply such a system to market farming on any sort of industrial scale, but for feeding the family at home it seems to have lots to recommend it. At our place, it does, anyway. YMMV, as always. I've described this polyculture subsistence farming perspective to friends, and then they say, "Oh, Permaculture." Maybe; except the touchy-feely bit is limited mostly to the silken texture of the spinach leaf as it goes into the salad bowl. For some maybe similar views, see Sharon and Greenpa. And: what do you think? Is Permaculture going to box itself in as a patchouli/grainola thing? Is that bad? Am I overreacting? What's going on? A couple of storms have brewed up and walked through here, snapping and popping. I saw them coming, and dropped everything and ran to toss all the fava bean vines, which are not done drying, into the potting shed, and brought in the braids of elephant garlic and brooms of peppermint as well. I had picked some basil and laid it out on a screen in the potting shed, under the greenhouse window, but that did not need to be moved. I put a Bach cantata on the forty-year-old turntable and stripped the mint into a cardboard box. It still felt a bit leathery, after three weeks of drying, so I covered it with a sheet of newspaper and set it behind the woodstove to air out a little longer before putting it up in cookie tins. Before all this happened, I was working on the frame for the new grow-house. This will, if all goes well, be a walk-in solar greenhouse ten feet by thirty, and seven feet tall in the middle. The frame is six hoops made of ten-foot one-inch polytubing pieces butted together, jutting from holes driven by the post driving tool and an iron bar. This would not be enough hoops, but I'm tying them all together with the ubiquitous seventeen-gauge wire, anchored to iron t-posts at the ends. It seems fairly sturdy, given that we usually don't get too much snow in the winter. Projected cost for the whole thing will be well under a hundred dollars. 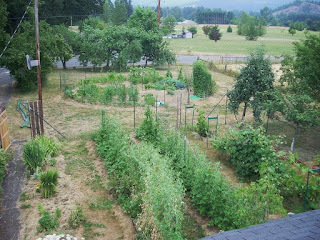 The building is placed over a thirty-foot run of two beds, with a pathway between them, in the garden -- the same ones that had the fava beans in them this spring. There's nothing there now but straw mulch, with here and there a squash vine or eggplant, and one of the ornamental poppies that were such a bright orange in May, but look supremely bedraggled at present. One of these beds will be Beloved's, and the other, mine, to plant as we wish for wintering over. We don't plan to heat this greenhouse; it's for keeping things from freezing that are relatively winter hardy, such as bok choi, celery, kale, lettuce, beets, chard, onions and the like. With any luck we'll plant before the middle of August. We may also use it for season extending for some summer vegetables, and as a hot house for melons, with which we've had the usual failures experienced by many gardeners here in the maritime Northwest -- depends on available time and energy on out part. In doing this we're following the advice of Maine farmer Eliot Coleman, who in Four Season Harvest explains that he doesn't much care for food preservation, especially canning, and was motivated to explore ways of running a kitchen garden for fresh vegetables straight through the winter. One would think that Maine is too far north for such a system, but, as Mr. Coleman explains, day length is the determining factor for vegetable growth, and wind, rather than frost, is the principal enemy of tender plants. He lives on the 44th parallel, as do we, and the 44th parallel runs through France (! ), where winter gardening has long been a productive and tasteful art in the potager, as well as on truck farms. We've had beets and such every winter, but this last year, lost a lot of plants -- notably chard, spinach, bok choi and celery -- to a night that went down to 12 degrees F. So we aim to plant while the days are long enough for the young things to put on growth, then shield them from wind and the worst effects of deep freezing in the next Long Dark, and see how we do. A garden frog awaits. The next bean beetle will become a has-been beetle. One sees much more of this kind of activity in a garden that has not been blanketed with poisons. There are also hummingbirds nesting in the garden, in one of the plum trees. So much going on! 2. Harvest something - potatoes, dandelions, elephant garlic, radishes, onions, yellow zucchini, turnips, turnip greens, favas, peas, chard, mustard, lettuce, spinach, strawberries, broad beans, basil, chives, rhubarb, stevia. Thrashed kale seeds. 3. Preserve something - made pickled onions, bok choi stems, and peas in the pod, which turned out really well. Froze spinach, three containers. Dried mint. 4. Reduce waste - bringing home bottles, boxes, used newspapers, bubble pack, and yogurt containers for assorted projects. 5. Preparation and Storage - drying fava beans and kale pods for seed. Garlic, potatoes. Drying basil. Beloved bought quite a lot of blueberries from a nearby farmer and cooked some down which we will have with yogurts, and froze the rest. 6. Build Community Food Systems - selling duck eggs; giving away Egyptian onion bulbils at work. 7. Eat the Food - From frozen: pear sauce, chicken broth. From poultry: duck and chicken eggs. From storage: wheat, oats, rye, molasses, vinegar. From garden: bok choi, turnips, turnip greens, potatoes, zucchini, favas, elephant garlic, onions, kale, chard, dandelions, peas, lettuce, spinach, chard, strawberries, mint, basil, chives, stevia. Some may remember that a few days ago, risa was hanging fava bean vines between the maples out back, and that there was a large dried-out shrub hanging upside down on one of the trees, which she mentioned was kale. Yes; when you let kale go to seed it becomes practically a small tree, covered with at first a galaxy of small yellow flowers, then a thousand or more Lilliputian "bean" pods. A couple of days later, Beloved mentioned that the kale seemed "done;" that is, some of the pods were sproinging open and dumping out their tiny seeds. That sounded about right to me, so I got out an old sheet and spread it on the ground, then gingerly took down the dry, feather-light kale bush and laid it in the center of the sheet. From the barn, I brought out a square-point shovel, and whaled the kale but good for about three minutes. All the stems broke, and the bush flattened out encouragingly, so I found Beloved, who was weeding around front, and we lifted the sheet between us and poured its contents into a large steel bowl. I brought the bowl into the house, gathered one handful of pods after another, and "panned" for kale by swirling the pods, crunching them up from time to time with my free hand, in a colander. As seeds fell out of the resulting detritus, and rolled round and round the bottom of the colander, they found the holes and fell into a second steel bowl, leaving behind most of the chaff. I'm sure I must have thrown quite a lot of seeds onto the compost heap along with the chaff, but that's the way of threshing and winnowing; the object is to get what one needs, not to chase down every minuscule seed. I'm leaving the bowl on the counter for a few days, in case there's still too much moisture in the seeds for packing; then they will go into old 35mm film cans. I'm thinking of keeping just enough for us, in a small envelope, and giving the film cans to our local food bank gardens, who gave us some surplus starts this year. After all, turn about is fair play! Sharon has up a tongue-in-cheek post about a magazine she'd call "Better Homesteads and Ratholes" .... if she had the time! 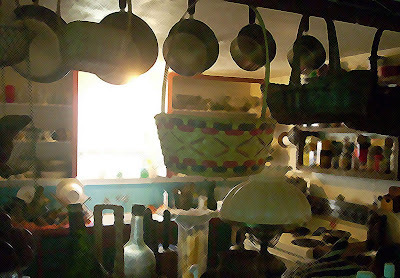 The inside of our place (cleverly obscured in the photo by computer artistry, to protect the guilty -- click pic to see obscurity writ a bit larger) is seldom seen because we are sometimes sensitive about its shortcomings -- no bought furniture, shelves made from scrap wood, heaps of clothing and doodads not put away, balls of cat hair drifting across the floor like tumbleweed, and happy spiders in the corners. Dishes pile up, too. We're trained to feel badly about this extremely common state of affairs, and the training can be hard to shake. I tell Beloved that others both work, too, and can't do everything -- or, really, anything (!!) that we all see in Better Homes and Gardens, or our local version, Sunset, and that, even those who have lost their jobs (and they are many around here) and presumably have time on their hands, find themselves too depressed to straighten up -- so that the world is actually one vast conglomeration of fouled nests -- but to no avail. Not that either of us can get to it, but she mourns. I feel her pain in the pitiful way she says, "Oh, sweetie! You did dishes at eleven o'clock last night! My heroine!" Then when we actually break down and have anyone over, they invariably say, "I like this place. You can relax here." Words used include "homey," "cottage," "unpretentious," "real," and "honest." We do like to hear these things, even though it's best not to parse "unpretentious" without having a glass of homebrew first, to, umm, soften the blow. When home at all, we do a lot of our living out of doors, and when we come in and sit down, we walk the shortest distances we can, and sit down heavily. Places where we can actually sit are surrounded by garden books, letters (we still get letters), a spoon bowl, half-finished glasses of solar tea, a harmonica or dulcimer, or the National Geographic. Coming inside is what we do when there's really only time to decompress a bit before hitting the pillows. So we've made an art of getting right to the decompression. Also, not being young, we can't remember where we have carefully stored anything, so we carefully don't store anything. Glasses, keys, screwdrivers, baskets of peas, instructions for assembling compost barrels, left shoes, and with any luck, right shoes, are all out where we can see them. A mess? Yes, but it's our mess, and lends function to a stressed work life, and at its core, the vital resting and relaxing gets done. And what you don't see a lot of in this mess is credit card receipts. That's the significance here. All that fancy advertising and the cleverly pitched advertising that passes for informative articles in the magazines really had only one function, anyway -- to separate you from dollars by convincing you that you must surround yourself with signs -- expensive ones -- of upward mobility, which you could only afford by leveraging yourself -- giving to others claims, sometimes multiple claims, on your anticipated future income, in exchange for looking rich. Honeys, don't fall for it. As soon as we all passed two billion in number, we were all poor. And getting poorer. Instead of hocking ourselves for the BIG tv, the BIG car, the BIG couch, the BIG hutch with the BIG set of entertainment china, and the BIG riding lawnmower, let's all try being rich in all the value there really is: kindness. Get up and do a few dishes at eleven p.m. Your sweetie's smile is your fortune. July garden: three beds have been cleaned of spring things and are resting up for fall planting. Two of these are slated to go underneath a polytunnel greenhouse. Note corn and winter squash at upper right. Knee high by the Fourth of July! 1. Plant something - Not a thing this week! 2. Harvest something - Zukes! ... turnips, turnip greens, favas, potatoes, dandelions, elephant garlic, onions, peas, chard, mustard, lettuce, spinach, strawberries, basil, chives, knotweed. Rhubarb, rhubarb, rhubarb. 3. Preserve something - blanched and froze fava beans. Putting up garlic braids, storing "new potatoes." 4. Reduce waste - Made an awning from recycled burlap coffee sacking. 5. Preparation and Storage - drying fava beans and kale pods for seed. Garlic, potatoes. 6. Build Community Food Systems - selling duck eggs; giving away veggies at work as conversation starters. 7. Eat the Food - From frozen: pear, apple and plum sauce, used to make reconstituted juice. From poultry: duck eggs, chicken soup. From storage: wheat, spelt, oats, rye, pasta, molasses. From garden: turnips, turnip greens, potatoes, zucchini (finally! ), favas, elephant garlic, onions, kale, chard, dandelions, peas, lettuce, spinach, chard, strawberries, mint, basil, chives, still mostly peas. This year, we have tried something new by making shades and awnings from burlap. The sacking we buy from a nearby coffee shop for fifty cents a bag. A single bag, cut open down the sides, and pinned to laths at each end with 1/2" staples and a couple of screws, makes a simple and surprisingly attractive window shade, which can be hung from existing curtain rod mounts, as here, or from three inch wallboard screws driven into the window frame or just above it. The shade can be folded in half to cover half the window, or rolled up to rest atop its mounting to uncover the window completely. It seems to admit about ten to fifteen percent of the light into the room. You can see through it to the world outside, if you stand close, yet you have complete privacy. Fits a window of about three by four feet, or can be cut down to fit something smaller. Not bad for fifty cents! If you attach the bag to the outside of the window instead, or even better, for the south side of the house, one on the outside and one on the inside, you will cut quite a lot of heat gain. Makes for a rather dark room, but we find we are twenty degrees (F) or more cooler inside, than out. We didn't attach outside shades, choosing instead to dry-soap the window screens for additional reflectivity. You can also stretch a bag between two laths mounted on wall brackets, to make an instant solar awning, or, better yet for the south wall, stitch together as many bags as it takes to shade the entire wall. The awning shown is a little sloppy, but that's me; I am sloppy. Besides, I was working alone on a windy day. Not the best plan. Too much light is striking the upper wall; on the other hand, the gap between the wall and the burlaps allows wind to pass through without tearing up the awning, and, as summer progresses, the shadow will creep upwards as the angle of the sunlight tips away from the near-vertical. Not visible in the photo is a length of seventeen-gauge wire, anchoring the end laths and running underneath the outer edges of the burlaps from end to end. At the anchor points the wire, which is doubled there, is tensioned with a stick to pull the whole thing tighter, much as one would tension end posts on a run of fence. This forty-foot awning cost less than ten dollars to make and the project took a little over two hours. If an old lady can do it, you can do it, okay? A northern-hemisphere July scorcher -- 93F. Daughter and Last Son were here; she pulling weeds and working on her tan and he down in the creek cutting beanpoles from knotweed, piling the twigs and leaves for me to mow and add to the compost. I pulled up the bed of fava beans to take around to the clothesline for drying, to see about saving seed. We took a lot of breaks. I poured water in my straw hat and put it on, dripping, for each new (short) shift. A garden snail-hunter friend, bereft of the shade of the favas, slithered off to pastures new. There were quite a few elephant garlic and volunteer potatoes in the bed, as well. I braided the garlic and brought in the spuds, which are enough to last for weeks. The plan is for part of this bed and the one next to it to be enclosed this fall in a polytunnel greenhouse, 10'X30', for wintering-over cold-weather vegetables more securely. Though it's awfully hard to think about winter right now. After hanging favas I worked with last son for awhile, stripping knotweed stems. "What would you plant over here on this side of the creek, if you were farming it?" I asked. "Yeah." Oh, my, he looks interested. "All the hops I've ever heard of involve cables, telephone poles and tall ladders and crews of a zillion pickers. Aren't there economy-of-scale problems?" "No, they do it different in Bavaria, more like a vineyard. I think. And brewers buy small batches as well as large. It can be a specialty." "Well, do ya want we should look into that?" We might get him back out into the country yet. He wiped the sweat out of his eyes. "Want to take another break? I want you to try that Hefeweizen Sis brought." He grinned. "What about mine?" "Okay, I'll just pour you a little glass." We crossed the bridge, passed the sun-sizzling favas, and stepped into the blessed shade of the front porch. We're at around 90 in the afternoons at our place this week, with a killer drying wind, but the well is in good shape yet so I left the drip hoses going all night in the six beds in the lower garden, and gave everything else a dewing from the hand-watering hose as the sun went down and the long twilight set in. Beloved changed out all the pools for the ducks and geese, and the chicken water. We are at 44 degees north, and at this time of the year you have enough daylight for this kind of thing to last you till ten p.m. The house is handling it well, better than ever before. The maple trees are finally tall enough to help some, there's more insulation, the south face of the roof now has a coat of white paint, beans are climbing the south wall, and there are awnings of burlap, and burlap shades, on the windows. I'm often seeing 65F on the inside thermometer when it's 85 outside, with no A.C. and no fans running. Usually we only have to start up the fans when it reaches 94 or more outside for three days running, which gives too much heat gain even for this house. The grass seed growers, up the road, are baling their straw in gigantic bales that must weigh six hundred pounds each. The sunshine reflecting from the unbaled windrows defeats my sunglasses and I have to look away as I go by. There are mirages on the fields and pavements. It reminds me of my Georgia childhood. Lately there is a lull in planting. A few potatoes in gaps. We have peas, lettuce, bok choi, radishes, turnips, kale, cabbages (red and white), Jerusalem artichokes, 6 kinds of tomatoes, eggplants, zukes, delicatas, butternuts, punkins, garlic, elephant garlic, turnips, green beans, runner beans, favas, yellow corn, white corn, rhubarb, nasturtuims, white onions, red onions, Egyptian onions, leeks, red potatoes, golden potatoes, strawberries, white grapes, red seedless grapes, parsley, cilantro, basil mustard, broccoli, collards, rosemary, marjoram, spearmint, peppermint, chives. There will be apples on two of the six apple trees and a scattering of plums. Cherries did well this year, pears are ok; there will be a lot of blackberries judging by the blossoms. Most of the pears, cherries, nectarines, figs and quince are too young to bear yet. What we harvested last week: Elephant garlic, onions, peas, chard, mustard, lettuce, spinach, strawberries, basil, chives. One rooster. A lot of Japanese knotweed for beanpoles and compost. I chose one kale plant to go to seed, and oh, my, did it! It's hanging up now in a maple tree to dry the pods, and there are THOUSANDS of them. I've selected some of the favas to save, and will save some peas, French beans, runner beans, potatoes and tomato seeds. All of these we have done before, except the kale, and the favas, which are a learning experience. We're still working full time, so there is only so much we can try. Favas come in an eating size and a green-manure size and we have a lot of the latter as that was what we were given. They are good to eat but hard to harvest. What I have learned: cut them from the stem with scissors, close to the first bean. Rest the pods in a basket for a day so the pods will deflate a little. Steam to blanch. Rinse to cool. Now when you squeeze the other end (like a toothpaste tube) the beans should slide out of each pod easily, ready to freeze, steam, fry, or what have you. I've built a solar dryer and we have hundreds of canning jars but most of what we have put up so far this year has gone into the freezer -- some choice greens, peas, and, umm -- lots of chicken and chicken broth. We rely a lot on things that self-replicate or are perennial. The Egyptian onions, elephant garlic, Jerusalem artichoke, nasturtiums, chives, parsley, rhubarb and blackberries pretty much take care of themselves. And the orchard just gets better every year. Also, a lot of our flowers are bulbs and can be divided, or seed themselves readily: daffodils, tulips, irises, flags, English bluebells, forget-me-nots, digitalis, poppies, sweet williams, lupine, sweet peas. And then there are the lilacs, which are so big they shade the house. Ours is not the easiest site because rains are too heavy 3/4 of the year and entirely absent 1/4, nights are too cold, the season is short, there's too much wind, plenty of pests, incredible weeds, we only have a limited water supply when it's NEEDED, and we're a bit north-aspected, so the ground seems like it has some kind of permafrost thingy going on. But we seem to do ok, as do many of our neighbors. The wind dies down a little after sunset, and we go sit with a glass of mint tea by the grape vines as the moon comes up, watching bats fluttering around the big oak tree. There are worse ways of growing old.